Framing samples, matboard, racks of paint and brushes…important, yes, but what’s MORE important is the people. The fellow artist next to you at the brush rack or the friendly staff member guiding you through your framing selection. Art Connection has been a source of professional picture framing and artist materials for nearly 18 years. We are proud of our knowledgeable staff that includes Sue who has been framing for more than 30 years and is a wealth of knowledge. Dana who has been with us for 16 years and never a problem she wasn’t happy to meet head on and usually solve. Holly and Liv are relative newcomers only having been on staff for 12 years each. Both teach in the community and are accomplished artists. Mary was at Farr’s for many years before we dragged her out of retirement and made her part of our team. Coni, specializing in framing for 26 years and Rondi specializing in art supplies and finding new goodies to tempt you, opened the business in February of 1993. The thing that makes it worth the struggle is you, the customer. As a shopkeeper there’s nothing better than seeing someone satisfied with the service you’ve provided. Some things you may not know about us: We order art supplies weekly and are happy to help you find what you need. Most of our fine art brushes are 15% off and most canvas is 40% off. 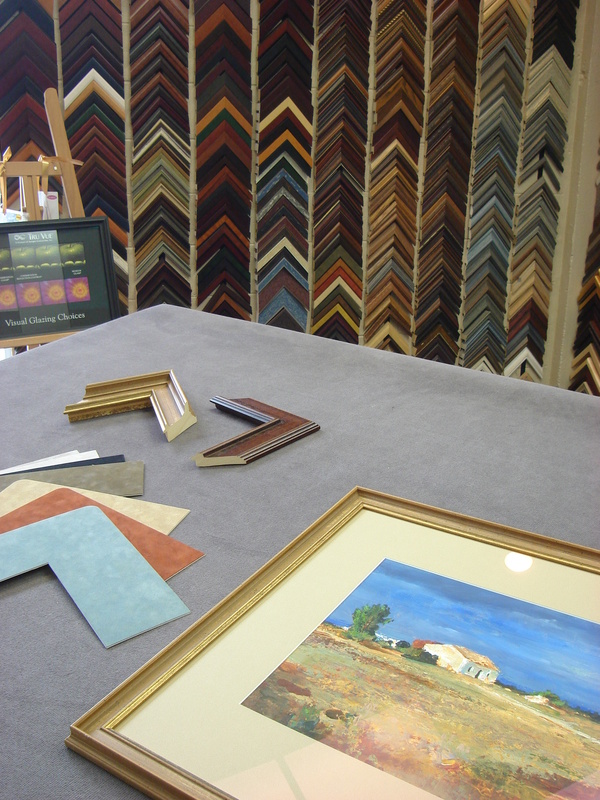 We have over 1,800 framing corner samples to choose from (yes, I counted!) We stock Bainbridge as well as Crescent mat board in regular and archival, and foam core from 32 x 40 to 48 x 96. We receive our matboard deliveries monthly and are happy to order for you. You’re always free to browse and see the new stuff, art materials and framing, anytime. We just received a new shipment of ready-made frames with linen liners, beautiful quality and great prices. We’re here Monday through Friday 9:30 to 5:30 and Saturday 10 to 5.